– Materials used to replace lost oral tissues are called restorative materials. – As mentioned earlier, those that replace lost tooth structure and restore the function of the teeth must be strong and hard. – Some restorative materials simulate the appearance of the tissues that are being replaced. – Tissues simulated by restorative materials include the enamel of teeth (fillings and crowns), the mucosa of the periodontium (dentures), and even the skin of the face (maxillofacial prostheses). – Materials that are tooth-colored are often called esthetic materials. – Depending on the degree of destruction of a tooth, different restorations or fillings are used to replace lost tooth structure. – Some restorations replace a small to moderate amount of tooth structure and are supported by the remaining tooth structure. 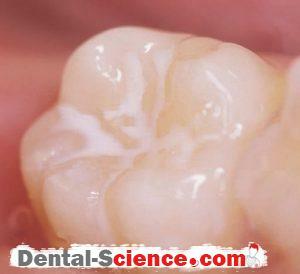 – Such restorations are held in the tooth by undercuts (mechanical locks), adhesion, or both. – An inlay is a restoration that is made outside the mouth, usually in a dental laboratory. 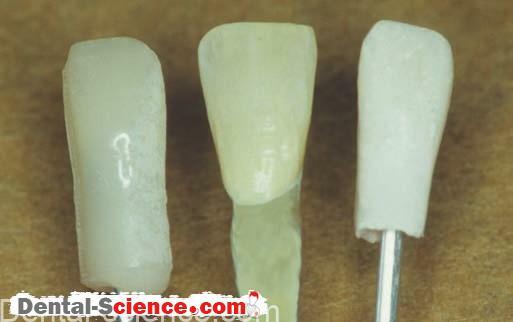 – Inlays do not have undercuts and are cemented or “luted” into the tooth. or overwork the chewing muscles. – Crowns are used to restore teeth when a substantial amount of tooth structure is missing. – Crowns encircle and support the remaining tooth structure. 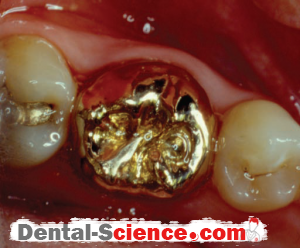 – Crowns are cemented in place similar to an inlay. – If a crown or filling is too large or over contoured, it will be detrimental to the health of the gingival tissues. – A dental bridge replaces a lost tooth or teeth. – A typical dental bridge is much like a bridge over a river. – At each end, the dental bridge is supported by an actual tooth called an abutment. – Each abutment tooth is prepared and then restored with a crown called a retainer. – The missing tooth is replaced with a false tooth called a pontic. – A pontic is a replacement tooth, but only the crown portion of the tooth is replaced. – The pontic and abutments are strongly joined together so that biting forces will not break the bridge. 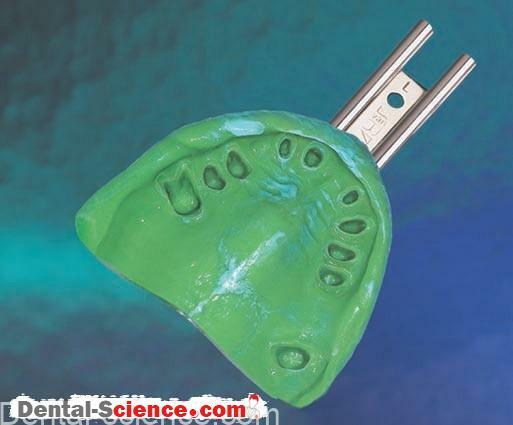 – The dental bridge is cemented onto the prepared abutment teeth in the same manner as a crown or an inlay. – Like all restorations, the physical size of a bridge is limited by the physiology and anatomy of the mouth. – Because of the ravages of caries or periodontal disease, some people lose many or all of their teeth. – A prosthesis is an artificial device that replaces a lost organ or tissues. – A complete denture is supported by and precisely rests on the mucosal tissue covering the maxilla or mandible. – If some teeth are present in an arch, the replacement prosthesis is called a partial denture. – A bridge is often called a fixed partial denture because it is cemented into place. – A removable partial denture is sometimes referred to as a “partial” and replaces few or many teeth. – A removable partial denture is placed and removed by the patient in the same manner as a full denture. – Typically, a removable partial denture has several metal clasps that are designed to encircle several remaining teeth so that the prosthesis is stabilized, somewhat like the abutments of a fixed bridge. an esthetically pleasing prosthesis for the patient. – The remaining natural teeth greatly stabilize the partial denture and significantly improve function. – When a restoration or prosthesis is constructed in a dental laboratory, a precise replica of the supporting tissues of the patient is required. 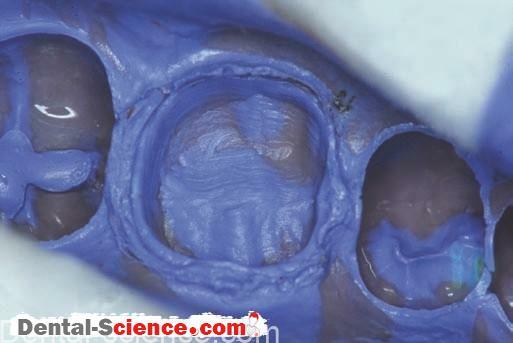 – The dental impression (or negative copy) is then filled with a material that solidify to form the replica. – If a restoration is constructed on the replica, it is called a cast. it is called a study model or diagnostic cast. 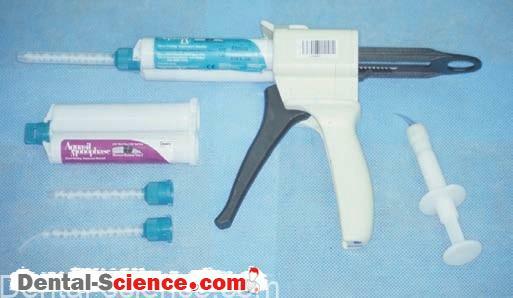 – A replica of the patient’s oral tissues is frequently used for both functions. – First, it is used to study the position of teeth and other oral tissues. – Second, it serves as an opposing cast to aid in the construction of a restoration. 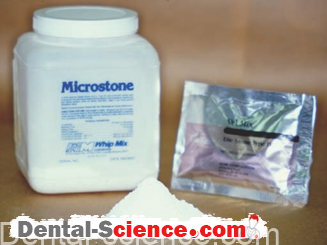 – A variety of impression materials are used in dentistry. – Most models and casts are made with gypsum materials, which are very similar to plaster of Paris. 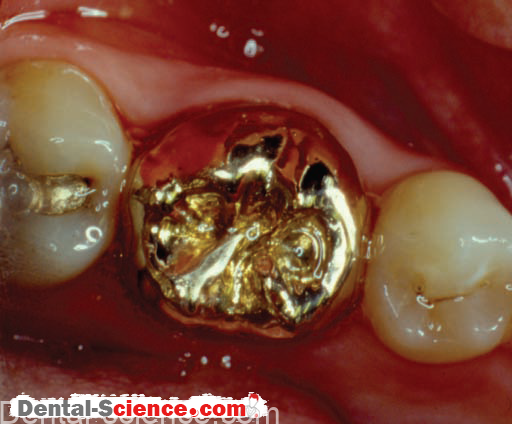 – After a crown has been made, it must be held in place (or “luted”) to the prepared tooth. – Luting is the same as gluing two objects together, and it is also called cementing. – Luting agents are frequently called dental cements. between the tooth and the crown. 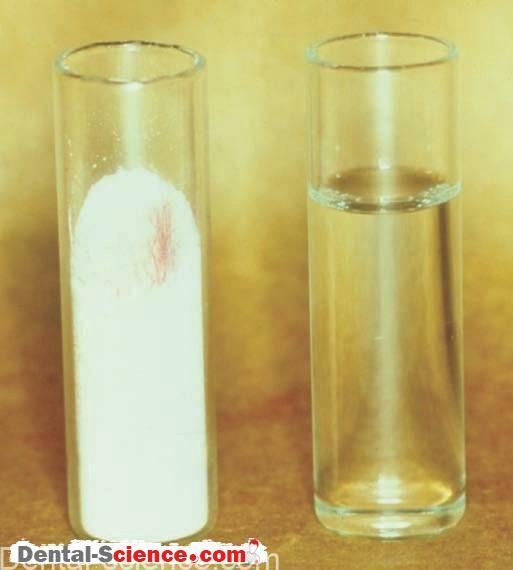 – After mixing, cements must flow like a thin liquid so that a precisely made crown will fit properly. – Requirements of dental cements are quite rigorous. – Proper handling of all materials, especially dental cements, is critical to successful patient care. insulating layers under metal restorations. – Metals conduct hot and cold much more quickly than dentin and enamel. – Using a base or liner under a metal restoration (between the pulp and the filling) can reduce or eliminate sensitivity to cold and hot foods and beverages. – The term base implies a degree of strength and thermal insulation, whereas the term liner does not. – Historically, bases and liners were distinct groups, but now much overlap exists. – The use of both terms best describes the function of these materials. – A liner would be a relatively thin layer of material painted on to protect the underlying dentin from chemical irritation. – A base has greater bulk, which serves to restore part of the missing tooth structure and to provide thermal insulation. – When a crown is made in the dental laboratory, the dentist and patient must wait days or weeks before it can be cemented into place. – What happens to the tooth that has been prepared for a crown? 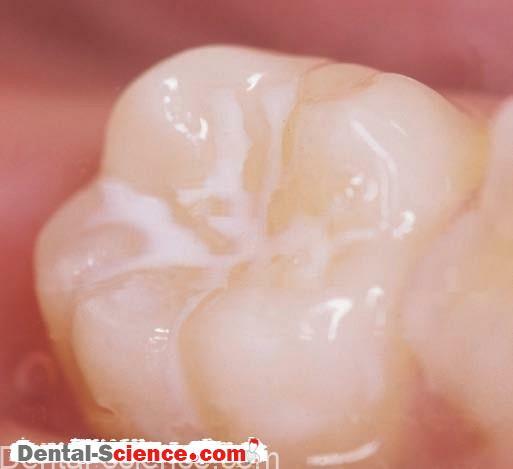 Such preparation requires that a surface layer be removed from the tooth. used to replace the missing tooth structure. 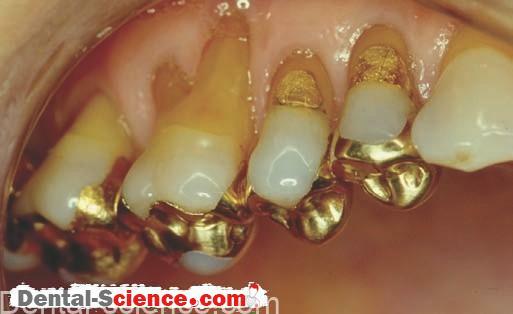 – Frequently, most of the enamel not already destroyed by decay is removed. is not protected in some manner. also is not esthetically acceptable. – What is done to solve this problem? A temporary crown is made before the patient leaves the office. – The temporary crown is constructed and luted during the same appointment in which the crown preparation is performed. – Temporary crowns are not as strong or esthetically pleasing as permanent restorations, but they provide adequate service while the permanent crown is being made. – Temporary crowns are typically made from plastics that are formed in the mouth. – These replicate the missing tooth structure very closely. – Other types of temporary like crowns of teeth) that are lined with the same plastic materials. – Temporary crowns must be removed when it is time to cement the permanent crown. – Temporary crowns are cemented with “weak” temporary cements so that they may be easily removed. – At times, a dentist is unsure of the best treatment for a patient or a particular tooth. – The exact condition of the pulp may not be obvious from the patient’s symptoms. – A dentist may remove all or part of the decay from a tooth and then place a temporary restoration to give the pulp time to heal before determining the specific treatment that is needed. – Treating biologic tissues, especially the pulp, is not as predictable as both the dentist and the patient would like it to be, so a temporary restoration is placed. – Several materials are used predominantly to prevent disease or trauma. 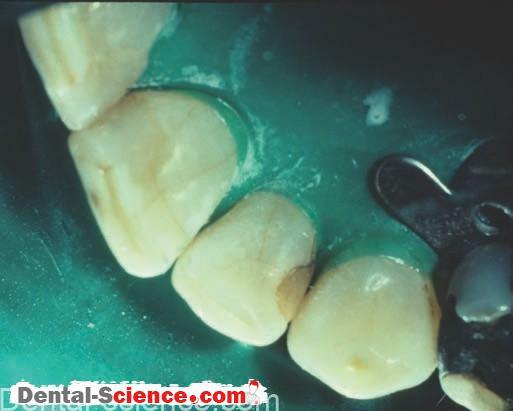 (A) Pit and fissure sealants, to prevent decay. (B) Mouth guards, to prevent injury during athletic activities. (C) Fluoride trays, custom and stock, which fit over the teeth to apply topical treatments. – Custom fluoride trays look very much like custom mouth guards or bleaching trays. – A tremendous amount of time in a dental practice is spent in polishing teeth, restorations, and appliances. – True polishing involves moving an abrasive over the surface of an object to remove a thin layer of material. – Understanding the polishing process is important to achieving the desired result. their speciaized nature, they are segregated from other materials. – Dental implants are typically screws or posts that are anchored into alveolar bone and that protrude through the gingiva into the oral cavity. – Implants are used to replace the root portion of lost teeth. – Implants are unique in that they are both inside the body (in the alveolar bone) and outside the body (exposed in the oral cavity). – Keeping the contents of the oral cavity from seeping along the surface of the implant into the supporting bone has been a very difficult problem. – Luckily, this may be accomplished with the use of several materials if they are manufactured and handled properly. – Dental implants are used to support a great variety of restorations or prostheses. – Single crowns, bridges, and dentures can be supported by dental implants. – Implants have had an extraordinary impact on patient care when traditional restorative treatments have failed to provide adequate function. – Many specialties in dentistry have products and materials unique to that field. – At times, these products overlap (e.g., sutures), whereas others are limited strictly to that specialty (e.g., “rubber bands” or elastics used in orthodontics). – Many times, the specialties of oral surgery and periodontics use the same (or very similar) materials for bone regeneration. – Some restorations are constructed directly in the oral cavity and are called direct restorative is placed in the “cavity preparation” that was “drilled” by the dentist when removing the decay. – Each material has its own requirements for the design of the cavity preparation. – When initially placed, a direct material is a putty-like material that sets to become a hard, strong material. powdered metals. The freshly mixed amalgam is placed directly in the cavity, is carved to resemble the missing tooth structure, and then hardens. and are set by a specific chemical reaction. (C) Glass ionomers and other cements, which are mortar-like materials that set by an acid-base chemical reaction in the mouth and resemble tooth material. – Other materials must be fabricated outside the mouth because the processing conditions of many materials would harm oral tissues. – Such materials are called indirect restorative materials because they are made indirectly on a replica of the patient’s oral tissues. shape needed for each patient. (B) Ceramic materials, which are processed by a number of techniques. Many times, a ceramic powder is fired at a very high temperature and becomes a solid object (just as a clay pot is fired). An example would be a porcelain crown. or cured at elevated temperatures and under high pressures. An example would be the pink “gingival” portion of a denture. – Although they are referred to as permanent, they are not. – Fillings, crowns, bridges, and dentures do not last forever. in a well-maintained oral cavity, however, will give the patient years and years of service. – The cycle of restoration and re–restoration of teeth is becoming an important factor in the practice of dentistry. – What is best for the patient for a lifetime of oral health must be considered along with the immediate dental needs of the patient. (e.g., a week or a month). is being made at the dental laboratory. 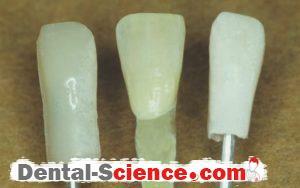 – Temporary restorations are sometimes called provisional restorations. – is presently undergoing orthodontic treatment. – A large composite restoration may be adequate until orthodontic treatment is completed or the tooth is close to its fi nal position, and a permanent crown may then be fabricated.